The three-part entry on Dublin continues. Turning away from the dark alleys, let's center in on our favorite base of operations--Paddy's Palace. But, to talk about Paddy's, it's important to mention the Lazy Piece of Sith who turned us onto the place--RyGuy. This is the peep who'd mapped out 'n planned a large part of our Dublin adventures. One o' the things that we'll be referring to as "his fault" is Paddy's Palace. Wouldn't have it any other way. Let's kick this off with a little music. It's the Cost That Counts: No, seriously, at some point the pro-vs-con scale tips towards absurdity with the amount of amenities you get for your dollar value at some places. Paddy's is one o' those places. No curfew and a 24-hour check-in are big tipping points. Free noms when you wake up in the morning? Ooh, yeah! Livin' large! Mix in some crazy awesome employees, a bit o' stereotypical decor and some passable dorms, and you have a taste of Paddy's Palace. Did I mention that it'll run ya less than ten Euro if you plan ahead? Consider it mentioned. It's quite literally a steal. In fact, the one thing we're hoping for on a return trip is free WiFi. Staying at Paddy's put us within a three-mile walk of every place we wanted to check out while in Dublin. If we happened to come across something outside of that distance, then the bus station was just a block or two away. What little time we actually spent in the hostel was divided between sleeping and hanging out with other travelers... "other travelers", in this context, easily includes the employees. Almost all hostels are run by travelers. The single day that I actually spent indoors was spent online. I worked a trade with the employees to clean the computer and install security software to earn the time that I spent hogging the computer. With Flesh and Ink: Of the three in our party, I was the only one without any Irish blood. That doesn't mean that RyGuy 'n Gaea are Irish. Even if you've got the blood, don't be "that guy" who's tellin' everyone that he's Irish. He's not. You're Irish if you're born to the land and that's it. No exceptions. Despite the handicap of our birthplace and lineage, all three of us had a heavy interest in seeing The Book of Kells at Trinity College in Dublin. We made it just in time. Excuse me while I wax poetical, as The Book of Kells truly does defy the petty descriptives known as "words". Trinity College is where you'll find restored copies of the the book, a work inked and etched into dried flesh. It is more tome than book. The calligraphy stands out in three-dimensions from the pages, as it was applied in layers of inks, metals and minerals. Many of the folios are laid out flat behind glass so that you can clearly see them. The Celtic knot-working, mythological creatures, calligraphy and ornate Latin all stand out from the pages, sometimes vivid and bright... othertimes faded with the ages. While a bit heretical, the closest comparison I have is a computer's circuit board... a beauty in its own right. International Alley: I've got no idea what the actual name of the street is in the photo above. I could look it up... but I'm not gonna. The flags from all around the world earned it the nickname "International Alley", 'n that's the name we're going with. Besides, the name's not important. What's important is that the street is the quickest way to get from Paddy's Palace to Grainger's Pub; from Point A (the point of sobriety) to Point B (the point of intoxication). And Grainger's is right where we'll be picking up on for the final post in this series. It's the intoxication that counts. That is all. Notes on the Song of the Day: I won't usually write about the song of the day, but this one's an exception... this one hits close to home. Telefon Tel Aviv was once a two-man project. In January of '09, that ended with the death of Charlie Cooper. While it hit the electronic music community pretty hard, none of us will ever be able to truly sympathize with the loss experienced by Joshua Eustis--Telefon's surviving member. This one song, "Lengthening Shadows", is the only song that Joshua has produced since the death of Charles. It was produced at the request of friend and fellow musician Apparat. The silence that followed Charlie's death has been filled with this single song, a song filled with the heaviness, longing and "spirit" that conveys everything that cannot be said... because it must be "felt" to be understood. It can be purchased or gifted from [Here on iTunes]. Notes on the Leading Photo: You can find the original version of my photo for this post [Here on GoogleMaps]. 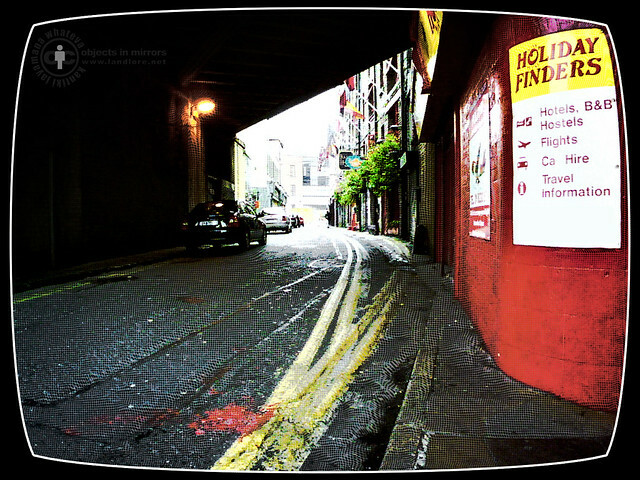 It was also used in the album art for "The Smell of a Storm" EP (which was dedicated to Paddy's Palace). The album is up for free download [Here on BandCamp].